What is OWLR Motion Alerts? We also do not store your Motion Alerts or any camera password on our servers -- after an Alert is sent to you, it is deleted from our servers to respect your privacy. What does OWLR Motion Alerts cost? After the trial, we ask for 99¢ per month or your regional equivalent. This 99¢ will give you access to motion alerts for all of your cameras. Why does OWLR charge for Motion Alerts? We (OWLR) are a third party software developer. Rather than charge for our apps, we seek to fund our business through the creation of better services on top of our app and your cameras. Sadly, Amazon and other services we use do not give away their services for free and our team can only live on Ramen and parental hand-outs for so long. To expand our offering (to machine learning for Motion Alerts, to safe and secure storage for your Alert Storage), we need to raise money for the development for future features and projects. By charging a small amount for our Motion Alerts, we can keep the app ad-free and free to download. 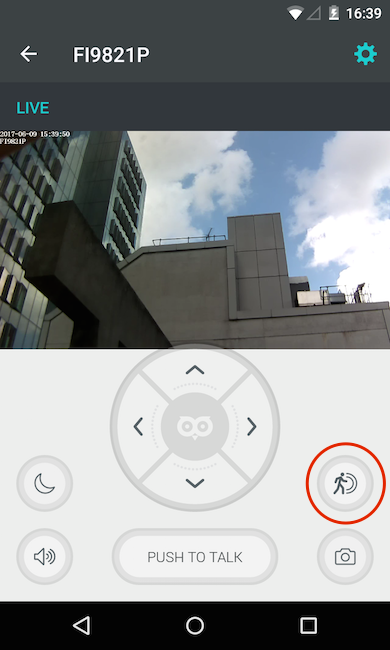 If your camera supports Motion Alerts and is set up for external access, you should see a small running man on the right-hand side of the Control Panel on our Detail View or on the Settings screen of the camera. Does your camera model support motion detection? Check this [list http://daniel-needs-to-finish/] for the cameras we have confirmed supports motion detection. Is your camera configured for external access? In order for the OWLR app to control your Motion Alerts, it needs to be able to connect to the camera when you are out of the local network. If your camera is not configured for external access, then you need to follow this page for how to set it up. Is Push Notifications allowed for the OWLR app? Check in the Settings section of your phone to make sure the OWLR app has permission to receive Push Notifications. Is the Push Notifications turned ON in the OWLR app? Make sure the Push Notifications button in the Motion Alerts screen for the camera (found within the OWLR app) is turned on and that Motion Alerts is also turned on. Is your email in the OWLR Motion Alerts correct? Please check you have entered the correct email address. Is the Email Notifications turned ON in the OWLR app? Make sure Email Notifications are on in the OWLR app. These can be found under the Motion Alerts Settings screen. [TECHNICAL WARNING!] The following is a little more technical for testing, and we recommend that you try this if you are comfortable with using your camera's web interface. Can you send an email? On this page, there should be a "Sender E-mail" test button under 'Mail Settings'. If your camera is connected to the server, you should receive an email once you've done so. If you do not receive an email after testing you SMTP connection, then we recommend going back to your OWLR app, finding our Feedback button (on the top left or in the About section) and please contact us for more help. Please know that if you are feeling frustrated, annoyed or angry with the OWLR Motion Alerts, you can get in contact with our Customer Support Team to help. As a Motion Alerts subscriber, you get priority attention from our team. However, if you still wish to cancel your subscription, you can do so by following these instructions. First of all, we are not able to unsubscribe you from our premium services ourselves. This is due to how in-app payments are handled on the Google Play Store and Apple App Store. You will need to unsubscribe via the Store yourself. Please enter the Google Play Store. Select the OWLR app from your list of installed apps. Click on 'SET UP' to unsubscribe. Please enter the iOS OWLR app. Click on the OWLR logo on the bottom right of the screen. If you still need help, please get in touch with us using the in app-feedback button or email us here. We are more than happy to help!